Labor shortages. Automation. The growth of omnichannel retail. 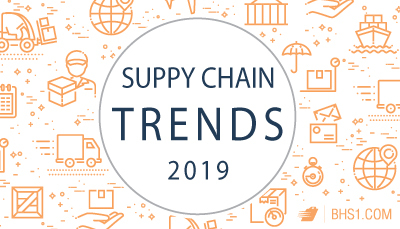 The trends that transformed the global supply chain over the past few years are likely to continue for some time; these forces also provide hints as to what’s to come in the near future. In fact, some of 2019’s challenges are clearly on the horizon. On-demand warehousing brings flexibility to the supply chain. The gig economy is coming to the distribution center. On-demand warehousing allows suppliers short on DC capacity to temporarily store excess stock at a third-party facility. Some on-demand operators offer the whole suite of order-fulfillment services, including customer service. Others provide space while the client supplies their own order-fulfillment team. Regardless of the details, expect new digital services to match short-term warehouse providers and DC-strapped suppliers in 2019. Sustainable supply chains become a strong driver of brand reputation. As of 2018, business owners overwhelmingly reported pressure to operate supply chains sustainably. That’s according to a survey of 1,400 professionals across the globe, with results published in the trade publication Supply Management. A total of 90 percent of the survey respondents said that sustainability was a “key factor” in their choice of supply chain operators. Over the next three years, pressure to emphasize sustainability in the supply chain will increase, said 72 percent of the respondents. Warehousing labor shortages remain a continuing challenge. E-commerce will continue to grow through 2019, adding to the labor shortage hampering the warehousing industry. Through the end of next year, the industry will require 452,000 workers, according to a report from industrial real estate powerhouse CBRE, as reported by Material Handling & Logistics. Unfortunately, the industry only adds around 180,000 new jobs every year. That’s been the case since 2013. Successful logistics providers will have to use some combination of incentives, automation, and productivity-enhancing warehouse equipment to keep up with an ever-growing demand. Self-driving trucks won’t arrive in time to solve the trucker shortage. To hear Silicon Valley tell it, self-driving semi trucks are right around the corner. Meanwhile, the shipping industry is expecting driver shortages of up to 176,000 by 2026. Automation’s move to the road seems inevitable. But even if entrepreneurs perfect the technology sometime in 2019 — a big if — some analysts say our legal systems are nowhere near ready to replace human drivers. Current liability law does not fault manufacturers, so if a driverless truck causes an accident, who’s responsible? To get self-driving trucks on the road in force, the U.S. would need new laws in place. That’s a challenge that the engineers can’t solve on their own, even if they can train trucks to handle inclement weather and unexpected driving scenarios. In short, the shipping industry will still need to find ways to attract new drivers through next year at least. These are hardly the only issues supply chain industries will face in 2019. The impact of new rounds of tariffs will likely start to filter into consumer pricing, with unpredictable effects on spending. Extreme weather events may disrupt key shipping lanes. The truth is, we won’t really know the supply chain trends that will shape the years to come until they are upon us; the trick is to remain agile and flexible. Buist, Jacki. “Supply chain sustainability improves brand reputation.” CIPS. CIPS, 23 Feb. 2018. Web. 24 Sept. 2018. Kline, Daniel. “How Can America Solve Its Truck Driver Shortage?“ Fool. The Motley Fool, 20 Aug. 2018. Web. 24 Sept. 2018. “On-demand warehousing ready to be a game changer.” SCMR. Peerless Media LLC, 24 Sept. 2018. Web. 24 Sept. 2018. Premack, Rachel. “One of the biggest problems facing self-driving trucks has little to do with the technology.” BusinessInsider. Insider Inc., 12 July 2018. Web. 24 Sept. 2018. Sparkman, David. “Labor Shortage Hurts Logistics Industry.” MHLNews. Informa, USA, Inc., 10 Sept. 2018. Web. 24 Sept. 2018.